Since I was in Nova Scotia for Hal-Con, and I’m staying until the holidays, I figured I should do at least one Christmas market. After much research, I found this one in the middle of Moncton, New Brunswick. Also look at these windmills! They’re at the border of Nova Scotia and New Brunswick. So pretty, but at the same time, a little creepy with their sheer height. JUST WHAT I LIKE?! 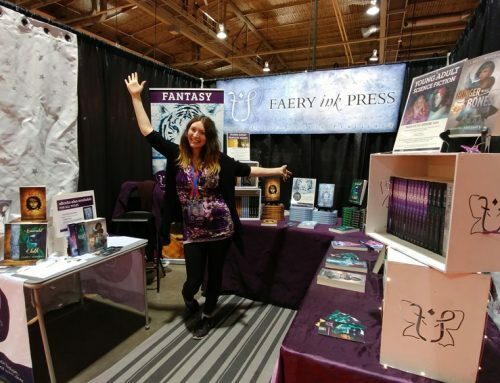 To follow my sales journey and to see how I did at past conventions, click here for the full list of articles. This was my first Christmas market and I think it was a good one to get me started. The Christmas market at the Coliseum is basically an institution in Moncton—this was its 29th year. From talking to the other vendors, I gleaned it used to be much bigger. In any case, this was a major test for me, and a major risk at that. 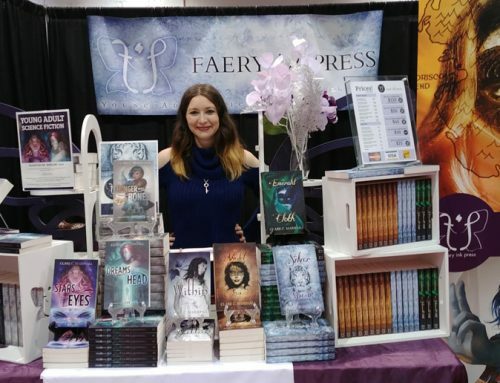 For the most part, I’ve been exhibiting at comic cons and book festivals. This is probably the first non-speculative related event I’ve done. 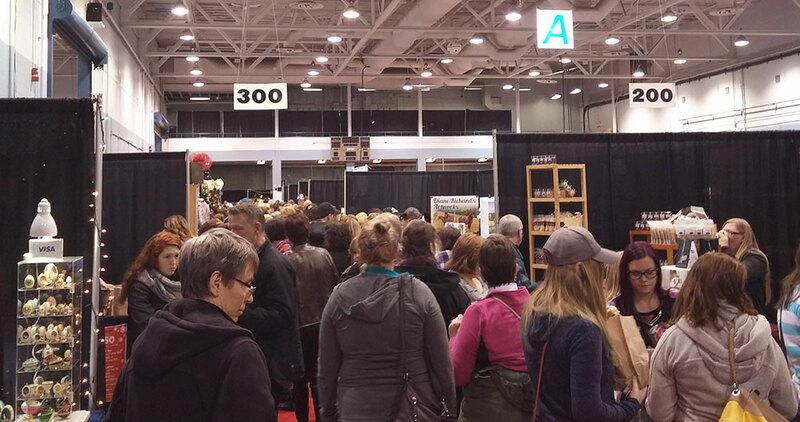 Fortunately, it was a good risk, as I sold lots and got to introduce my brand to the good people of Moncton and beyond. The thing about doing Christmas markets out of province is you’re always at the mercy of the weather. The hours for this show were so long (10am to 9pm on Saturday!) that when it was slow, it sucked majorly. I had a lot of lookers—people would walk down the aisle and slow down just to take in what I had going on at the table. Which was a lot. I was very happy to have my sister Jessie around. Her “DON’T SHOW ANY TAPE” rule may stick on me someday. She creatively used fishing line to tie back the fabric, just like she did at Hal-Con. 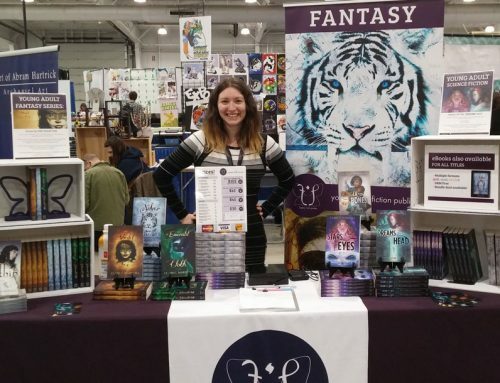 Also she helped me make the horizontal banner appear NOT droopy! YAY. The secret to success here was also fishing line. To continue my previous display themes, I stole some of Jessie’s furniture to create height and a little alcove area (it would have been cute to have a little Friendly Giant scene in there…oh well!). And I FINALLY GOT BOOK STANDS. No more awkward propping against flimsy books. YAY. I took some Christmas decorations because a) obviously, it’s a Christmas market and b) there was a prize for best display (which I sadly did not win, haha). I thought more vendors would be into decorating the booth but turns out, a lot of them were selling Christmas related items anyway. I used one of grandmother’s nutcrackers and my other grandmother’s tree. We decorated the tree with pretty, sparkly ornaments from the house. It’s a light up tree, and we could have plugged it in (FREE ELECTRICITY! Seriously, cons usually charge $70 A DAY just for the privilege!) but the plugs were all taken and alas we did not have an extension chord. We brought a second table for gift wrapping. Jessie created a little station. It took a couple of customers to get into the rhythm of gift wrapping but I think the area looked super cute. This show had a lot of expenses. The booth was $450—there was nothing smaller than a 10×10. I also had to pay for three nights in a motel, gas, food…etc. So my minimum sales goal to break even was pretty high, as was my target goal. Fortunately, I met and exceeded it! I was extremely close to selling out of The Violet Fox. 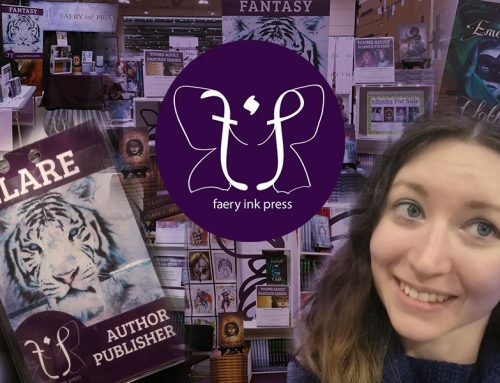 It didn’t take long to make my first sale, and my first sale was a Violet Fox bundle—unusual for people to drop that much money on an unknown author! I did my usual discounted Friday thing, though I probably didn’t have to, because I sold almost half of my Violet Fox stock on that first day. I mean, they did warn me that sales were brisk, but I didn’t expect them to be extremely brisk. Most people were eager to pay with cash, and I only had to inconvenience one person for not having debit. I would have completely sold out of everything had it not been for the unusually slow Sunday. I only did around $100 in sales—basically nothing compared to the previous two days. I think the storm warnings hit everyone pretty hard. Had it not been for that storm warning/heavy snow later that day, I would have met and exceeded my Calgary Expo numbers. Ah well! 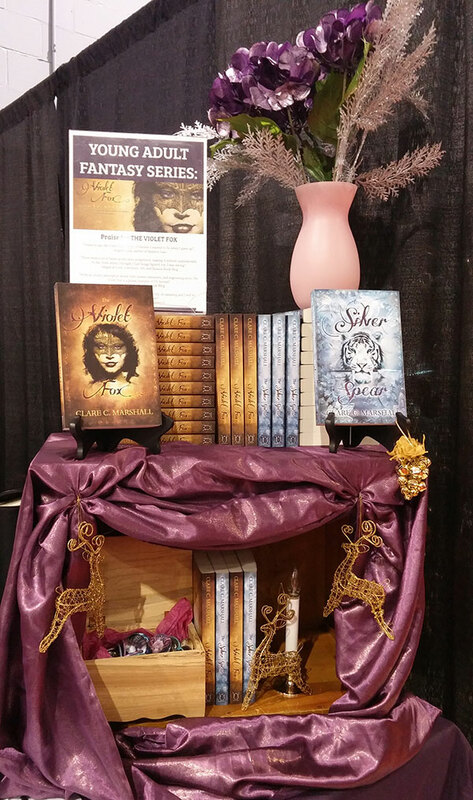 One tip I got from a buyer was that it wasn’t completely clear that I was the author. True, this is a question I’m asked constantly, especially since I brand myself as a publisher more than an author. Usually at events there’s room for me to write my name and title on my badge. I ended up doing that here, though it got me thinking that having an official nametag might be beneficial, especially if I have one or two other people working with me at the event. Surprisingly, the gift wrapping wasn’t as successful as I’d hoped. I bought a special sparkly purple gift wrapping set from Winners just for the occasion. We even did a decent job of remembering to upsell it to the customers. I think the problem was that I had to rely on Jessie to do it (because there were so many people, I couldn’t stop to wrap a present AND sell the next person on the product), but Jessie wasn’t always physically at the booth. We charged $2 for the wrapping, which Jessie did beautifully. I considered doing it for charity. That probably would have gotten a far greater response—though it was short notice to add the gift wrapping component in the first place and I didn’t want to rush a charity partnership. Furthermore, I’m strongly against adding a charity component to any project for the sake of bolstering interest or sales. In general, people told me that gift wrapping was something they liked to do themselves as a de-stressing activity, or that my books would be a stocking stuffer and not require wrapping. 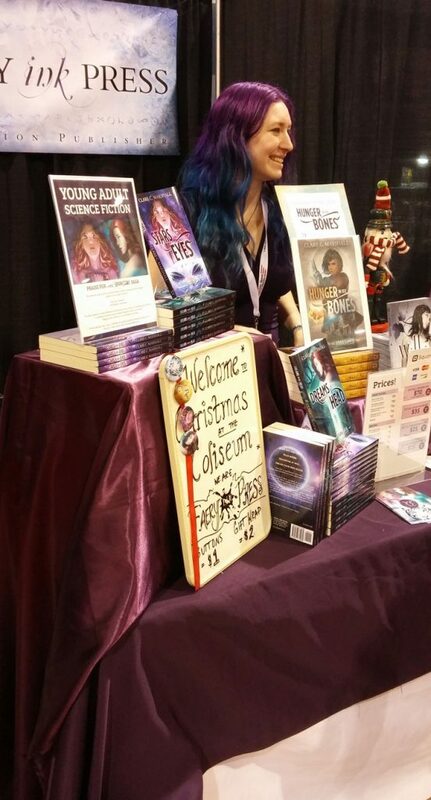 All in all, even with the extremely slow Sunday, Christmas at the Coliseum just barely knocks Edmonton Expo out of its second place slot for sales this year. For an established Christmas market, I was expecting more established brands to monopolize most of the spaces. By that, I mean small businesses run by creative entrepreneurs like me with an established look and product(s). And there was some of that. The booth across from mine sold nightlight lightboxes with exchangeable slides. Very cute. The people to my left have been doing the Christmas markets for years and sold Faberge eggs. But there were also a lot of unbranded or less-than-branded jewelry people, people selling random Christmas or old things from their attics, and people with good-looking products but terrible displays. To my knowledge, I was the only book vendor. Attendees told me that there was another author or two a few years ago, but they stopped coming. I’m not completely surprised. 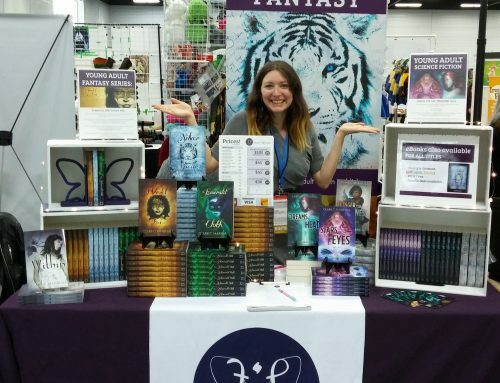 With the cost of the booth, you’d have to be local and/or have a lot of product and/or have a solid brand to make this market worthwhile as a single author. My sales at this con, I think, were boosted by the sheer fact that I AM a Maritimer. Everyone wanted to buy or at least look at books by a fellow East Coaster, which really created a sense of community for me. More attendees than I expected were from Nova Scotia. About half the people in attendance were French, and many more were bilingual. A couple spoke French to me, and I could understand enough to reply in English. Yay for *some* French education in my rural area. Gotta get bilingual one of these days!! Interestingly enough, several parents bought my books for their twelve and thirteen year old children because they “should” start reading more in English. Which I’d never even considered as a purchase decision. So that was very interesting. Overall, everyone was extremely nice, staff and attendees included. I was invited to or told about multiple other markets and festivals I should attend—including the Frye Festival. Someday that would be a great one. •	Moncton is full of pregnant ladies and young kids! It’s not often in my experience that you see so many younger people in the Maritimes. Good to see that there will be a new generation of Maritimers SOMEWHERE. Then again, I know that the Christmas market is a skewed demographic—of course families are going to want to go, and thus I saw many. •	Christmas music would play at a comfortable level on the loud speakers. This was pleasant—I enjoy background music at comic cons because it really adds to the ambiance. Yet I wished they had another CD. It was the same Christmas mix CD, for three very long days. I guess this is what working in retail is like? •	I had people recognize me from Hal-Con. It’s hard to say. Theoretically I could send someone to the show. It would drastically cut into my profit—and of course, bad weather could destroy all my business. I’m going to have to think about it in the months to come. I’d love to have a presence in Moncton, or the Maritimes in general, during the holidays. I did ten shows in 2016. Jessica did the Expo Holiday Show for me (thanks Jessica!) and I’m hoping to make an appearance there next year. Will I do as many in 2017? I have four shows confirmed, and about seven more that I’m applying for. 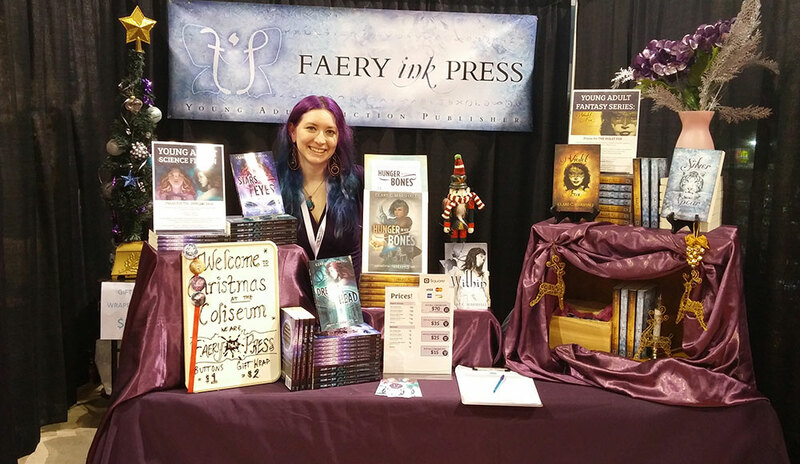 Going aggressive on larger shows this year not only boosted Faery Ink Press sales, but made my freelance business even more successful. So it’s a big part of my business plan for 2017 and possibly 2018. I don’t think it’s 100% sustainable to do every year—one convention can be extremely tiring, and doing several in a row is taxing on the body and brain. It’s not the most conventional method of distribution, but it works for now, and it does spread the brand across the country in concentrated bursts. I was one of your visitors at Moncton’s Christmas at the Coliseum. I purchased a copy of Violet Fox for my daughter which you signed for her. I have to say it was a big hit. It has a place of pride on her bookshelf next to her signed Rick Riordan book we got her a few years ago. She just finished reading it a few weeks ago and loved it. She’s asking us to pick up the sequel and any other books by you, so I think we might be new permanent customers. Thanks!